The Philippines invites Korean businessmen to come to the archipelago to look at lucrative investment opportunities in the tourism industry taking advantage of what is known as "public-private partnership policy" which has recently been introduced by the new government, visiting RP undersecretary of tourism Simeon P.Marfori II said on Sept. 28, 2010. 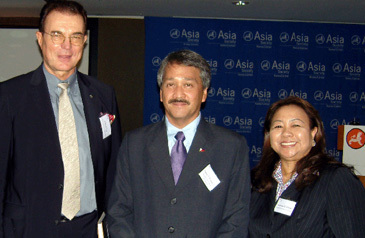 Attending as a special guest speaker at a presentation session organized by the Asia Society at Hotel Lotte in downtown Seoul, Mr. Marfori highlighted to members of Korean travel trade business community the many advantages offered by both the central and local governments of the Philippines such as increased incentives, most especially on medical, entertainment and golfer training and language programs to name just a few. Founded in 1956, Asia Society is the leading global and pan-Asian organization working to strengthen relationships and promote understanding among the people, leaders, and institutions of the United States and Asia with offices in Seoul, Manila, Hong Kong, Houston, Los Angeles, Melbourne, Mumbai, New York, San Francisco, Shanghai, and Washington, DC. Tourist arrivals in the Philippines have been growing at an average of 5.85 % from 2004 to 2009, reaching its peak in 2008 at 3.1 million. There was also a slight decline in 2009 due to the global financial crisis, he said. As to the prospects for 2010, he expressed confidence in attaining 3.3 million in tourist arrivals by the end of this year. The Philippines made the pitch to attendees, which included the property developers, business executives, heads and representatives of travel and tourism companies, travel writers, and the Korean media . Among them were Lee Charm, president of Korea Tourism Organization, Paul Kim, CEO of Korea BlackBerry and Steve W.Chung, CSO of CDNeworks. Lee Charm (left), president of Korea Tourism Organization poses for camera with Under Secretary Marfori II (center) and Tourism Attache Maricon Ebron at a Seoul gathering on Sept. 28, 2010. “With long established mutual relations with the Korean stakeholders, we are now focusing on expansion and exploration into other forays of tourism investment, which is a priority category for foreign investments in the Philippines,” he said. Among projects in the pipeline also include in the areas of marina, convention, golf, water skiing and medical tourism. He then disclosed that the tourism industry is now worth more than US5 billion dollars and expressed optimism about the prospects for foreign investment in Philippine tourism, citing the comparative advantages enjoyed by the country. On the competitive advantages of the country, Undersecretary Marfori II enumerated such factors as skilled managerial talents and technical manpower; rich natural and cultural tourism resources, with an abundance of tropical landscapes and man-made attractions that include Unesco World Heritage Sites, which are suitable for ecotourism ventures. Tourist arrivals rose 13 percent to 1.7 million in the first six months of the year from 1.5 million year-on-year. Data from the DoT Seoul office showed that Korean and American tourists accounted for a combined 40 percent of the six-month volume. The figures include 116,109 Filipinos permanently staying overseas. The data excluded migrant Filipino workers returning home. Tourist arrivals peaked in June when they reached 308,326 from 264,455 on year. Korean tourists were the biggest visitors to the Philippines at 333,617, up 32 percent on year, and accounted for early 19.5 percent of the total volume from January to June. In the meantime, Philippine DoT was reported to have set aside one-third of its 2011 budget in promotions, to help boost foreign visitor numbers amid sagging figures following the August 23 hostage fiasco that killed eight Hong Kong tourists. Appearing before the hearing of the appropriations committee recently, Tourism Secretary Alberto Lim said P476 million will be allotted for international tourism promotion to attract tourists all over the world. The department has proposed P1.5 billion for 2011 to cover the budget of the office of the secretary (P1.3 billion), Intramuros Administration (P32 million), National Parks Development Committee (P115 million), and Philippine Tourism Promotions Boards (P65 million). “We are going for quality tourism because we have to protect our environment. We will spend money where we can get the best results,” Lim told the committee. Stepping up its marketing strategy to draw in more tourists is a main focus of a new National Tourism Development Plan, which Lim said his office will launch soon. But to make the country attractive to tourists, Lim said that a number of work has to be taken such upgrading of airport facilities, development of infrastructure, access to communication, and liberalizing access to the country through the open skies policy. He said the government will start by rehabilitating the Ninoy Aquino International Airport 1, which handles most international flights. “By November 15, you will see a different NAIA 1,” he added. The P476-million international tourism promotional budget will focus on tourists from the Asia Pacific and the United States and Canada. The department has allotted P87 million for tourist promotion for Asia Pacific, which includes Hong Kong, Taiwan, Singapore, Vietnam, Malaysia, and Australia. For US and Canada, it will spend P86 million; Korea, P64 million; Japan, P43 million; Europe, P38 million; China, P23 million; Middle East, P15 million; India, P12 million, and other promotion, P8 million. It will also spend P100 million for promotions using new media. Not expecting the Hong Kong market to come back to the country immediately following the hostage-taking fiasco, Lim said his department is tapping tourists from other countries such as Russia, Korea, India, and the Middle East. He said the country lost some P40 million due to the August 23 incident based on the 3,360 cancellation of hotel bookings in Regions 1, 4, 6, and 7. “But the damage is much less than we were expecting,” Lim said, refuting reports that there were about 1,000 cancellations of bookings from European tourists. Despite this, he said he is confident the country will achieve its target of 10-percent increase in tourist arrivals this year. By the end of the year, he said he expects some 3.3 million visitors would have entered the country. For next year, the department targets 3.6 million tourists and 325,000 in jobs generated. By the end of the President’s term in 2016, Lim said the administration hopes to have drawn in six million tourists and generated some 665,000 new jobs.